The Magnificent 7 Variety Show is one of the best Branson shows that features incredible singers and dancers on a musical extravaganza with the tunes of the 40s to today. Playing at Hamners’ Variety Theater that is beautifully located at the Shepherd of the Hills Expressway, the show is complete with drama, comedy, singing, side splitting, dancing, and more. This two-hour variety show provides wholesome fun and excellent entertainment for the whole family with Country, Gospel, Swing, Rock, Motown, Disco, Broadway, and more. Joe and Tamra Tinoco together with their ten-year-old daughter Talya, as well as a cast of talented singers and dancers, perform on stage for a unique variety show like no other. 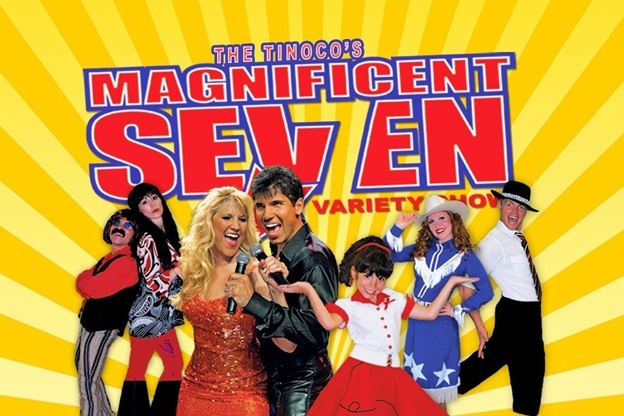 The Tinoco’s, the cast and crew of the Magnificent 7 Variety Show are back in Branson celebrating 12 Award Winning Years. Known for their amazing versatility, outstanding vocals, amazing dancing, comedy and drama, they are sure to astound you with favorite hits from the last seven decades. The 7 awe-inspiring entertainers perform 75 awesome production numbers for unbelievable fun of exciting and entertaining show from beginning to end. This awesome variety show is one of the most spectacular Branson shows that the whole family can enjoy! This family-friendly show brings you dramatic performances, Big Band Swing, 50s and 60s Rock ‘n Roll, and scintillating country vocals. The Tinoco family and the Magnificent 7 cast have performed for two years with the world famous Osmond Brothers showing their award winning act back to Branson. The incredible performances in this variety show by a whopping 75 production numbers are complemented by a load of laughs and 200 rapid-fire costume changes. The last seven decades of great music with varying musical genres, and everything else brings a sensational variety show, and it can all be enjoyed in Branson. The stars of Magnificent 7, Joe and Tamra Tinoco are accompanied by brilliant slate of performers that help make this awesome variety show explodes with energy. The dynamic team of seasoned artists that consists of Cameron Hansen, Bethany Hansen, Cassie Sears, and Dusty Wooldridge brings a unique experience for everyone from ballet to Broadway. The youngest member of the wonderful line-up is ten-year-old Tayla Tinoco who already has years of experience in entertainment. The Magnificent 7 Variety Show in Branson just keeps getting better, faster and entertaining than ever. From the moment the variety show begins, you will feel a different level of energy as the entertainers start their incredible performances. Regardless of your age, you are sure to take a trip down the memory lane, going back to the swing and disco era. In this show, you will enjoy a different kind of fun from the past with the best of country, pop, rock ‘n roll, nostalgia, disco, patriotic, gospel and much more. If you are looking for a variety show that features a musical extravaganza with the tunes from the last 7 decades, watch the Magnificent 7 Variety Show in Branson that offers wholesome fun for the whole family.